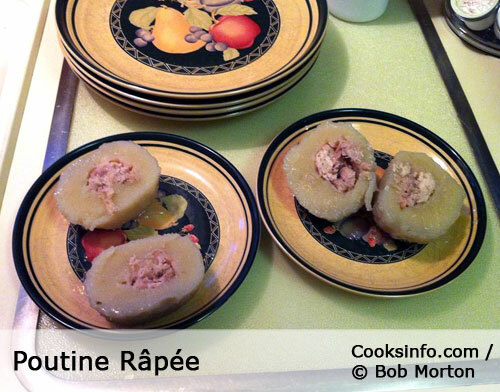 Poutine Râpée is an Acadian boiled dumpling made from potato stuffed with pork in the centre. It is made from both grated and mashed potato. 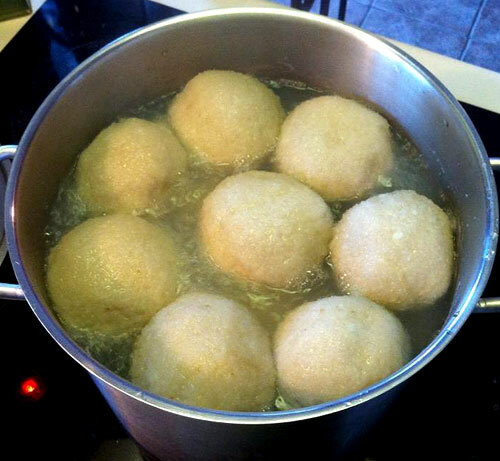 The dumplings are about the size of a large orange, with a greyish, glutinous appearance. They are very bland tasting, and can be eaten as a savoury, with salt and pepper, or as a sweet with brown sugar, maple syrup, cranberry sauce, small wild fruits, sugar, or molasses. The ratio of potato used is 2 part finely-grated raw potato to 1 part plain (no butter or milk) cooked, mashed potato. As you would for potato pancakes, you have to squeeze as much water out of the grated potato as you can. You then mix the squeezed grated potato with the mashed, and season with salt and pepper. You scoop up a handful of the potato mixture, and fold it around a tablespoonful of diced salt pork which has been soaked overnight in water, then mould it all into a ball so that the pork is enclosed in the centre. You roll the ball in flour, then put it into simmering salted water to cook for anywhere from 2 to 2 1/2 hours. You can also do the simmering in a stew. You can also slice up the ball, then fry it. Making Poutine Râpée is a fair bit of work, so they are largely made now for holidays and special events. They are traditional at Christmas in Acadian areas. In Nova Scotia, a version is made that doesn’t have meat in the middle, and is usually simmered in a stew. 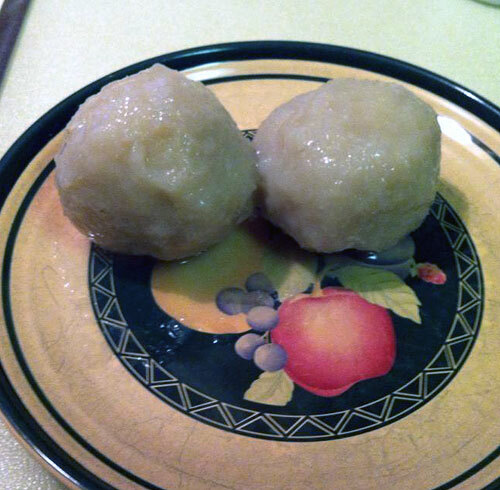 Some food sources feel that Acadians developed Poutine Râpée from imitating Klöße dumplings made by German immigrants. Acadians were expelled from south-eastern New Brunswick in 1755. A grant was given the land was given to 4 Philadelphia land companies. One company was headed by Benjamin Franklin, along with a John Hughes. The company was very disorganized, as Benjamin Franklin was in London, and John Hughes had accepted, unwisely it turned out, an appointment to administer the soon-to-be very unpopular Stamp Duties in the American colonies, so his life was unbearable and his mind was on other things. Though 9 men of this company signed an agreement to become settlers up in New Brunswick, 4 changed their minds and only 5 sailed: Michael Lutz (Lutes), Mathias Sumner (Somner), Heinrich Stief (changed to Steeves in 1771), Jacob Treitz (Tries), and Charles Jones (whose last name is sometimes mistakenly thought to be Johanes, but he was in fact of Welsh extraction.) By the time the Philadelphia land claimants arrived in June 1766, Acadians had already been given permission to return two years earlier, in 1764. The land the settlers from Philadelphia were granted turned out in fact not to be already-cleared Acadian farmland –it was uncleared bush. They couldn’t make a go of it there, and their company couldn’t give them the supplies they were due, so after two years they moved up to Hillsborough, where another settlement was underway. Also in the Hillsborough area were still some Acadians who had managed to avoid the Expulsion. One of the Philadelphia people, Heinrich Stief, had come from Germany, moving to Pennsylvania in 1749; his children along with their children’s families also came up with them. Together with other German settlers in the Hillsborough area, they formed a small group of perhaps 60 Germans in total. Such a small group would seem an unlikely source as the origin of Poutine Râpée based on Klöße dumplings, especially given that their numbers would soon be lost in the far greater number of Loyalists that began arriving in 1781. There is no particular reason, though, to look back as far as 1766 for the origin of Poutine Râpée from German influences. It is far more likely a more recent dish, dating from the middle or late 1800s when potatoes were actually accepted as food for humans. And that later dating actually greatly increases the chance of Poutine Râpée being German inspired. Since 1766, there has been a great deal of German immigration into the province, so much so that as of 2001, Germans are still the third-largest source of new immigrants to New Brunswick. It is entirely possible, if not more likely, that the dish and the German influence on it came about much later than the arrival of the 4 German families (excluding the Jones, who were Welsh), in 1766. Alternatively, it may have been brought back to New Brunswick by those Acadians who returned from Louisiana. 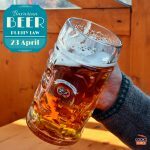 A little-known fact about Louisiana is that Germans began settling there as of 1690, and that Louisiana’s sausage-making prowess, for instance, comes from the German food knowledge that was absorbed into the food culture there. 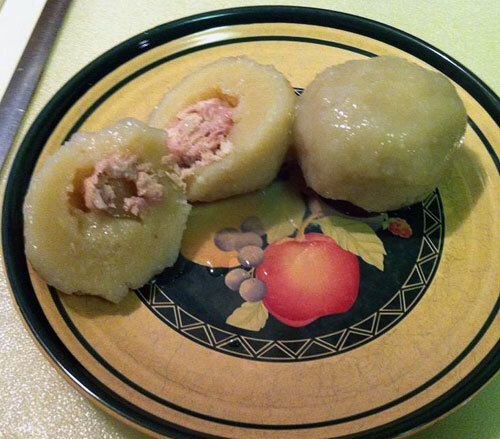 In any event, if you take a potato, make a dumpling out of it and stuff some pork in the middle, it’s guaranteed the Acadians would love it!